Having a “conversation” with Google should also be more natural. Ideally, you wouldn’t need to pull out your phone or tap buttons to use Google. We’re not quite there yet, but you can already do a lot with just your voice. 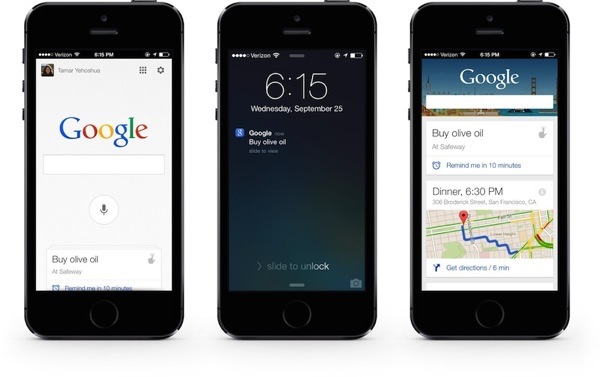 In the next couple of weeks, you’ll be able to download a new version of the Google Search app on iPhone and iPad. With this update, you can get notifications across your devices. So if you tell your Nexus 7, “OK Google. Remind me to buy olive oil at Safeway,” when you walk into the store with your iPhone, you’ll get a reminder. We’ll also show you Google Now notifications so you’re not late to your cooking class. Google Now was integrated into the Google Search app back in April and has become a powerful (and creepy) tool to help you with your everyday searches based on your location. Click here to download Google Search for iOS–it’s free. Are you using Google Search for iOS? It has a powerful voice search with a response time much faster than Siri. Turning off Google Now will save your battery life as well.